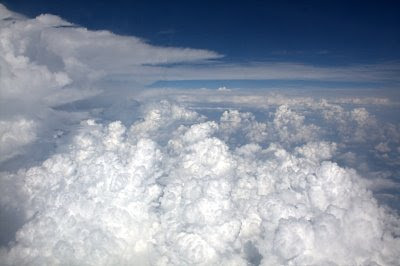 Flying up above the cumulus congestus, up towards the cumulonimbus, April 27th, somewhere northwest of Columbia, South Carolina, and taken above 10,000 feet, when I could legally use my digital camera, according to FAA regulations! Needless to say, it was a bumpy ride just after taking this photo. We were traveling from right to left in this photo, straight up and into the thunderhead. As we climbed up above the cloud level, the rest of the ride to Dayton was quite smooth. I love flying in an airplane, and I love taking pictures of the sky from this incredible vantage point. I had no idea that they have rules on digital cameras on airplanes now so I learned something. Fortunately for me I don't fly. Nice photograph of the clouds, Tom. They always look so nice from up there because you actually see the tops of clouds and we are used to looking up at them from down here. Other attendants don't seem to care. I can get away with a point and shoot, but this I took with my digital rebel. On this flight, I brought along a fully manual Pentax SP500 and snapped away on the descent and ascent. We flew into Dayton on this trip, so you probably could have seen us! Well done, Tom! Looks like cream to me! Well I don't fly, but that means I miss beautiful clouds like this! What a wonderful photo! Interesting about the rules altho I don't ever plan on getting in a plane. Nice shot! There's always so much depth from above. We might share the same name Tom.. but I do not share your love of flying... I just don't fly or travel well.. :O(.. I do however love to see the pictures from above the clouds so a big thanks for that. That is just plain gorgeous. I had no idea they had rules about this taking of photos on a plane...wow...I hope I have been in compliance! This photo is awesome! I'm fascinated with the photos taken inside a plane! It's like looking at marshmallows floating in the sea. A great view this is. Wonderful photo! I love clouds from airplanes, too. Didn't know there were rules for digital cameras on planes. What kind of airplane to you fly? Wonderful cloud shots. I am studying clouds with my second grade students right now. I just might use this photo as an example. Wonderful shot here. A stunning photograph! Well done! Like Abe I had no idea about the rules on digital cameras. Thanks for enlightening us! Amazing captures! It's a pity about those regulations about the digital cameras, but this shot is certainly enough to make up! I wonder whether hearing aids, pedometers and pacemakers count as "electronic devices"? It is a pretty sight from the air. The clouds looks like cotton balls. Beautiful photo! Beautiful cloud shot. Great flying. That is great. Must be flying yourself. Never seen a bird take a picture. The clouds look like whipped cream. Yumm and beautiful! That's such a great photo! I don't do much flying but I like taking pics of the sky from up there too. Reminds me of some shots I got over Oahu. I never heard of not being able to use a digital camera on a plane. So that's what they look like on the top side. Beautiful shot, Tom.